Out Of The Blue has been a magazine dedicated to exposing it’s readers to new music ever since issue number one was printed in 2001. Some of the articles are about unsigned talents, and most of those articles involve bands that play in parts of the state that the magazine is actually distributed. 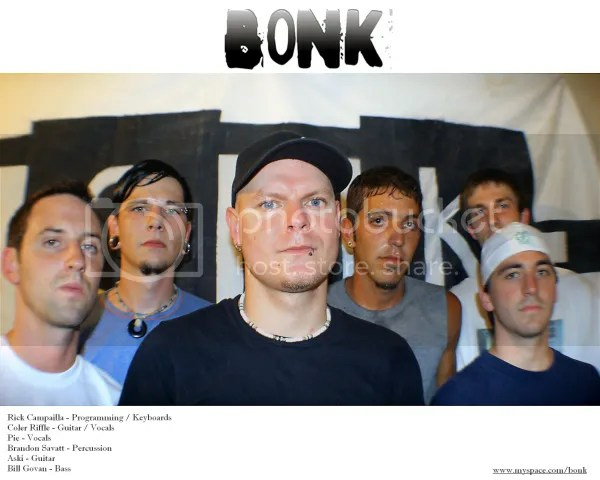 That will still be a focus, but when we find something that’s not too far away, that is really very talented, and we want our readers to know about them: introducing… BONK from Kent, Ohio! We’re all from the Kent, Ohio area and grew up together in bands of some form or another. We released our first record, Unfortunate Inspiration, in 2004 and recently released our second record Midnight Poetry. What are you guys about, what’s your message? We’re about writing music that means something to us, personally. And hopefully people hear the songs and can relate to them on their own level. We like to draw from our own unique experiences and others seem to have had the same feelings at some point in their lives. Our shows are high energy and always fun to watch but it’s also a party, a place where friends get together and forget about their lives for a few hours. Come out to a show or e-mail us and we’ll send you a free sampler. We want people to become a part of our family. What do you want to accomplish, goals? First and foremost our goal is to stay true to our music, to stay true to ourselves and to stay true to our fans. Also, to spread our music to people who haven’t heard us, on any scale that we can. We’d love to quit our jobs, we’d love to get a record deal, but we also love our music and what we’re doing now. We want anyone that wants our music or wants to check out a show to have that opportunity. How has your music grown over time? We as people have all changed in the sole fact of getting older. We’ve been in bands our whole lives and with the age, we’ve gotten jobs and grown up together. The thing that remains constant is our passion for music. Our music has grown in complexity and emotional depth, making every record better than the last in our eyes. Do you each have varying styles, and does that hurt or help the band? We are all over the board musically, we are a product of our generation. We take queues from metal, punk, hip-hop, classical, world music, electronica the whole gamut. It’s a big help that makes the music more diverse and complex, and ensures we aren’t easily pigeon holed into a genre or a scene. That’s hard to pin down, someone brings a riff to the table and we usually build from there. But, we’ve written songs by Brandon playing drums on his knees and someone humming a melody, it all depends.